6 Miller - Nelspruit Accommodation. 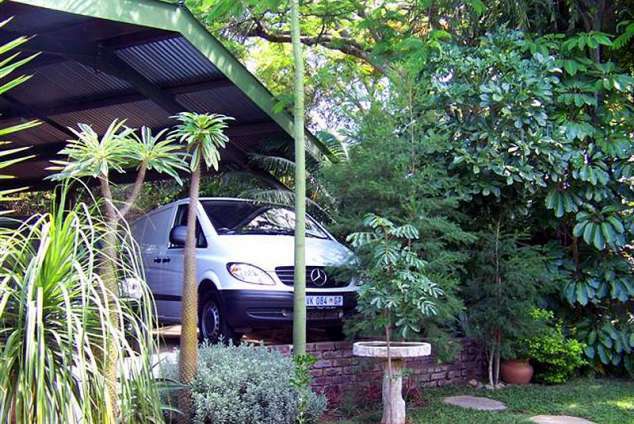 6 Miller is a tastefully decorated self-catering apartment situated in the heart of a lush suburb in Nelspruit, Mpumalanga. The spacious accommodation consists of two bedrooms, a fully equipped granite kitchen, full bathroom and an additional toilet. The main bedroom has a queen-size bed, air-conditioning, a wall-mounted heater and a TV connected to DStv and a DVD player. There are spacious built-in cupboards and a lock-up safe for your valuables. The kitchen leads onto a secluded patio, and is equipped with a microwave, hob and under-counter oven, a fridge-freezer, a kettle, toaster and all crockery and cutlery. Dish cloths and liquid soap are also supplied. The second bedroom also has a TV, spacious built-in cupboards and large windows that overlook the garden. Our balmy evenings are perfect for braais. Our swimming pool has recently been upgraded and is open to guests! We do supply tea, coffee, milk and sugar. Guests have access to the accommodation via their own private entrance and secure parking is available on premises. The Elephant Sanctuary and night safaris - Hazyview. Skyway Trails (Africa's longest aerial cable trail) - Hazyview. Quad Adventure Excursions - Graskop, Hazyview and Long Tom Pass. Abseiling, Kloofing, River Rafting (Geckoiing!) - Sabie and Hazyview. Caving by candlelight - Sabie. Fly fishing - Sabie and Dullstroom. Hot Air Ballooning - Hazyview. Horse Trails - Kaapsche Hoop. The Barnyard Theatre - White River. Jane Goodall Institute Chimpanzee Eden - Nelspruit. Maputo (Mozambique day tours) and Motapa Estuary Beach Tours. Shanyana and Nyani Cultural Village tours and evening festivals. Museums and Heritage Walks - Barberton. Why is your establishment interesting? Detail description : 6 Miller started as a hobby for us and turned into a passion! We enjoy interacting with you and sharing our day-to-day activities and other hobbies like Super bike riding, fly fishing, archery, scuba diving and bird watching if the opportunity arises and only if you are interested! ( You will only see us should you have a special request!) We only have one unit on the premises so you are in control of your own DSTV remote! If you are a group of four people or only one person, you have the unit all to yourself! You get to watch our wild Bushbabies come in to feed on Bananas and a mixture of honey, plain yogurt and baby cereal. Management is on site and always ready to tend to your needs and requirements. No fuss, relaxed accommodation! 20467 page views since 01 Jul, 2008. Last updated on 07 Nov, 2018.